Dominic Ingle has hit back after heavyweight puncher David Price publicly blamed the famous Sheffield gym for one of their own boxer’s defeats. 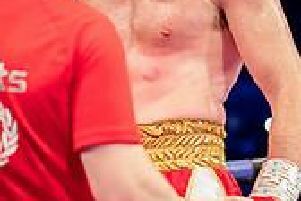 Atif Shafiq was decked by a savage right hand from Kazakh banger Andreas Maier on an ITV4 bill, last weekend. But Ingle poured scorn on Price, who himself has been KO’d three times. “People talk continually about our style of boxing without really knowing much about it. A lot of what is said is rubbish” said Shafiq’s trainer. “There is more to defensive boxing than holding your hands up, there is head and feet movement for a start. “Our boxing style would be better compared to Floyd Mayweather style; hitting without getting hit. “David Price is a nice fellow but probably doesn’t know much about us and recited what he has heard somewhere else. He’d probably never even heard of Atif before. Ingle pointed out Shafiq’s defeat followed an extended period out of the ring, due to injury. “He’d been out 13 months; I probably should have slapped him in the face to make him realise he was back in the ring. You can do sparring and training but if you have been out for a while you can forget the basics. “In football they say that you are at your most likely to concede when you’ve just scored while in boxing the golden rule is to be completely focused and pay attention in the first minute. “I’d said to him this guy is going to come out swinging bombs but Atif wasn’t paying attention. “He forgot the basics of keeping his mind on the first few seconds of a fight. He didn’t see it coming and got caught. “Then he probably got up too quick, he should have taken a knee. He is young and disappointed. But as he gets older he will learn to avoid mistakes like that” said Ingle. David Price, who is handled by Rotherham trainer/manager Dave Coldwell, is said to have put IBF champion Anthony Joshua on his back in sparring. *Chris Eubank Jnr has revealed ambitious plans for the next stage of his career should he overcome Renold Quinlan to win the IBO super-middleweight title next Saturday. The 27-year-old believes securing the lightly-regarded belt, and on what he hopes will be a significant audience in ITV Box Office’s first venture, will prove his “ticket to the big time” and future fights with George Groves, Gennady Golovkin, Billy Joe Saunders and James DeGale. Fighting for the first time at 168lbs, he has made little secret of his desire to win world titles there and at middleweight, as his father did in the 1990s. Eubank Snr was also involved in some of the biggest fights the UK has ever seen, those against Nigel Benn in particular, and after a frustrating period in which he missed out on fighting Kazakhstan’s Golovkin, he believes after next week he will again be sought after. “Winning the IBO is my ticket to the big time,” he said ahead of the fight at the Kensington Olympia. “With a world title behind me the sky’s the limit. I won’t have to be chasing anybody because I’ll have a world title of my own. This is a huge opportunity. “I know I can beat Golovkin because of my power and speed. I don’t fear his punching. I have sparred heavyweights and taken massive beatings, but the fact he can punch does not scare me. He’s not as fast as me, and I’ve said for a long time that he is not hard to hit. Hitting and not being hit is what it’s about. “The Billy Joe Saunders fight is one that I want; it’s a wrong that I have to put right. It hurts when you know you’ve lost a fight that you should have won. That can happen at some stage at middleweight. “Groves is definitely on the hit-list. He was even approached to fight me this time on ITV, but he priced himself out. He’s got the upcoming fight against (WBA super-middleweight champion Fedor) Chudinov and that would be better for me if he wins because that’d mean he has a belt to take off him. Next week’s fight with Australia’s little-known Quinlan also represents Eubank Jnr’s first since he underwent both dry needling and shockwave therapy in Dubai to treat a long-term elbow injury. From his preparations so far he believes it has significantly improved, in the same way his increased weight means he is no longer agonising over cooking programmes on television and is in a better mood. “I’m starving myself (usually at this stage when fighting at middleweight),” he said. “I’m watching that crazy TV programme, Man versus Food. It’s an American show, with a crazy guy going around eating all kinds of crazy foods. “That is what I would have watched religiously, every day, when I was making middleweight, but I have not watched it once this time. “I’m probably more upbeat, a little bit lighter to be around now and it’s because I’m not hungry. “The elbow has definitely improved. * Lee Selby will not defend his IBF featherweight title against Jonathan Barros on Saturday after the bout was called off just over 24 hours before it was due to take place. Selby was set to fight the Argentine in Las Vegas but it has been cancelled after Barros did not meet requirements set by the Nevada Athletic Commission, with the announcement coming just before the weigh-in at the MGM Grand. The 29-year-old was booked in on the undercard of Carl Frampton’s WBA featherweight title clash with Leo Santa Cruz, with Selby eyeing up a bout with the winner if he did the business against Barros. “Im terribly sorry and I’m almost in tears, all the hard work I put in with my team, my trainer, my management, “ he said. “Everything went perfectly but the opponent for some reason can’t fight and I am left without a contest. The only good thing is that I am returning home as world champion. “This was my big stage, my chance to shine. But trust me, I will be back. I will come again. Hopefully I can get straight back in the mix, get a quick win under my belt.